So what do you guys think? Should he make some more appearances? (The last line is a reference to Star Trek: TNG for you nerds out there, I heart Picard). 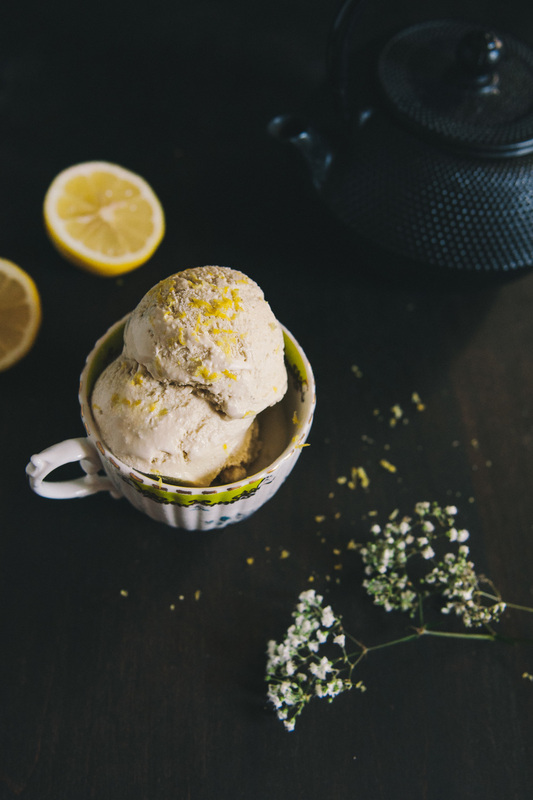 Since hot tea isn't as quite as enjoyable as cold treats during steamy summer days, what better way to infuse the heavenly scent of earl grey than into an ice cream? Sometimes when I come up with interesting ideas, they are absolute failures, but I would consider this fight of whimsy wildly successful. Yay. So much so that I would like to experiment with other tea flavored ice creams, but I'm guessing that most teas might not translate as well, unless they have a strong flavor like earl grey. Any ideas? During one of my test runs of this recipe, the heavy cream I bought was half solid (this was the first time I'd ever experienced this). It was really chunky, but it wasn't spoiled. I can only assume that during shipment to the grocery store, the cream was shaken or dropped and the fat had started separating and forming globs (for those of you who don't know, you can make butter by simply over-whipping or vigorously shaking heavy whipping cream!). I still used it since 1. it couldn't hurt to do a test 2. I don't like wasting things. It was a learning experience. Please be advised that using cream that has started separating/solidifying will not work! You will get small pieces of butterfat in the ice cream and it will leave a greasy, filmy residue both on your spoon and in your mouth. It is not pleasant, trust me :(. Along those same lines, when you're tempering the egg yolks, whip the mixture as little as possible, only enough to combine everything. You don't want to agitate the cream too much lest you get butter. For all the other steps, make sure to use a spatula or spoon. In a medium saucepan, combine 1 cup of cream, the milk, and sugar. Over medium low heat, dissolve sugar and heat mixture until foamy, right before it reaches a boil. Immediately turn off heat and steep earl grey for 10 to 20 minutes depending on how strong you'd like the flavor. While steeping, move the tea bag/infuser around with a spoon to get as much flavor out as possible (since milk/cream is more viscous than water, it doesn't steep tea as efficiently). Remove tea bag/infuser from saucepan. Place the other 1 cup of cream in a large liquid measuring cup or container. If any tea leaves escaped while steeping, set a fine mesh strainer over cream. Set aside while you make the rest of the custard. Whisk egg yolks in a medium mixing bowl. Using a ladle, slowly drizzle in a cup of the warmed milk/cream/tea mixture while whisking to temper egg yolks. Pour tempered yolks back in saucepan. Turn heat to medium low once more and heat custard, stirring constantly with a spatula or wooden spoon, until the mixture thickens enough to coat the back of a spoon, but make sure not to let it reach a boil at any point. Turn off heat and immediately pour custard into reserved cream (through the mesh strainer if necessary). This cools down the mixture quickly. Let cool for another 15 minutes then place in fridge to chill overnight. Before churning, add lemon juice and give it a good stir. Then churn in ice cream maker according to manufacturer's instructions. If you want it firmer than soft serve consistency, transfer to a container, cover, and chill in freezer for at least 4 hours. 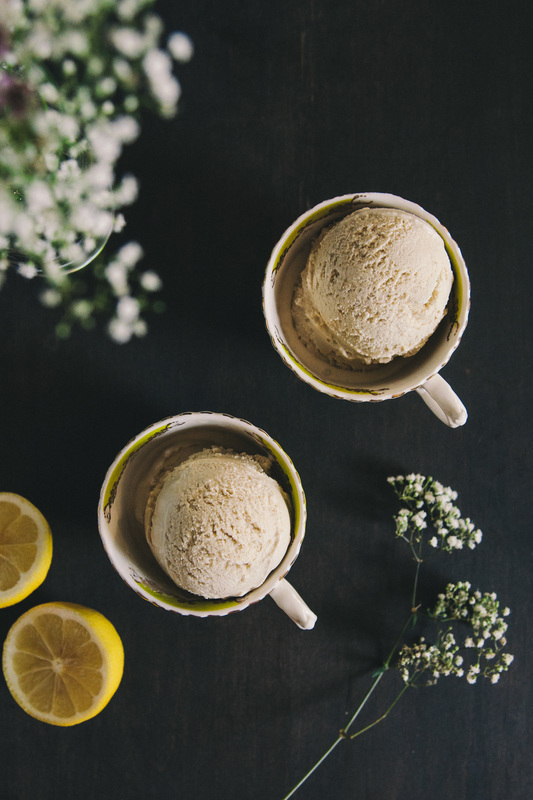 Scoop, top with some optional lemon zest, and enjoy!